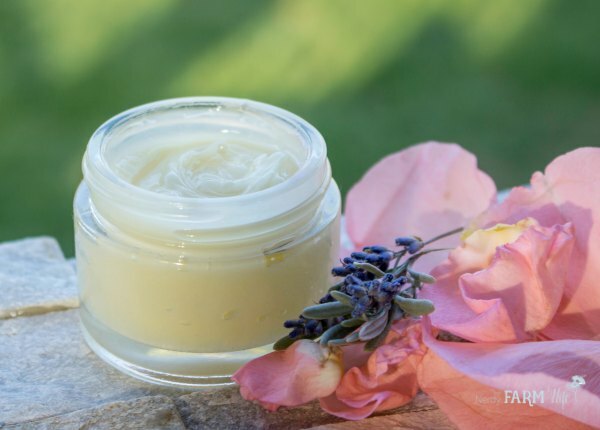 This lavender rose balm recipe was requested by newsletter subscriber Patti, especially for her mom who gets sore from sitting in a wheelchair. Patti’s mom loves lavender and roses so I combined the two scents together along with calendula in a balm designed to help soothe and heal chapped irritated skin. To get the creamy texture shown, be sure to stir the balm frequently as it cools. If you’d rather have a smooth salve-like texture to pour into a tin, just skip the stirring part. Both end products will work equally well, they’ll just have a different look and consistency from each other. Sunflower oil – This is one of my favorite oils since it’s light and suitable for all skin types; it’s also extra protective of damaged skin. Calendula flowers – This soothing herb is well known for its ability to heal and repair. Beeswax – This natural wax thickens the oil so it becomes an easier to apply balm. Lavender essential oil (Lavandula angustifolia)- Besides having a wonderful calming scent, lavender is helpful for many skin ailments. Geranium essential oil (Pelargonium graveolens)- Geranium is added for a rosy scent, but also encourages faster healing time (source, p 61). Manuka essential oil (Leptospermum scoparium) – This is an antiseptic oil that’s useful for treating sores, warts, blisters, diaper rash and much more (source, p 81). If you don’t have sunflower oil, try sweet almond, apricot kernel, rice bran, avocado, hemp, or another favorite oil. Instead of calendula, you could use plantain leaves, violet leaves, dandelion flowers, or elderflowers. For a vegan option, try using half as much candelilla wax as beeswax. You may need to remelt and adjust oil/wax amounts to get a consistency you like. If you don’t have manuka essential oil, try using a drop or two of tea tree essential oil instead, or leave it out completely. Manuka has a milder scent, so the fragrance of the finished balm will be different with tea tree. 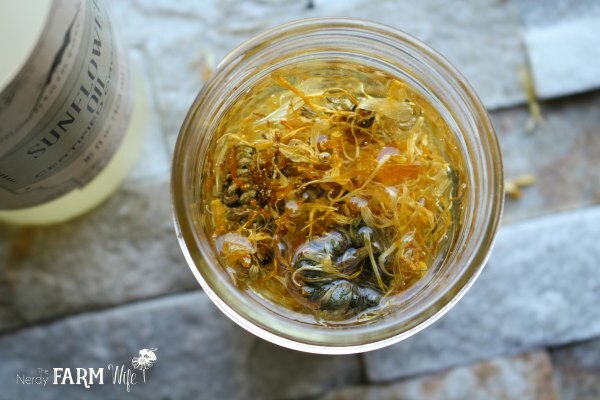 Fill an 8 oz canning jar half way with dried calendula flowers. Pour sunflower oil into the jar until almost filled. Stir with a fork or chopstick to release air bubbles. Cover lightly with piece of cheesecloth or scrap of old t-shirt, secured with a rubber band. Place in a sunny window for at least 3 or 4 days, allowing the heat from the sun to infuse the oils. Alternatively, place in a saucepan with a few inches of water, and heat over a low burner for 2 to 3 hours. Related: Here are 10 Things to Make with Calendula Flowers. Weigh the infused oil and beeswax into an 8 oz canning jar or upcycled tin can. Set the jar into a saucepan containing a few inches of water. Heat over a medium-low burner until the wax is completely melted. Stir in the essential oils and pour into a small glass jar. Stir frequently as the balm cools, for a creamy texture. Apply to chapped irritated skin as needed. For a light scent, try 10 drops lavender, 8 drops geranium and 8 drops manuka essential oils. You can add more essential oils for a stronger scent, up to 48 drops total. 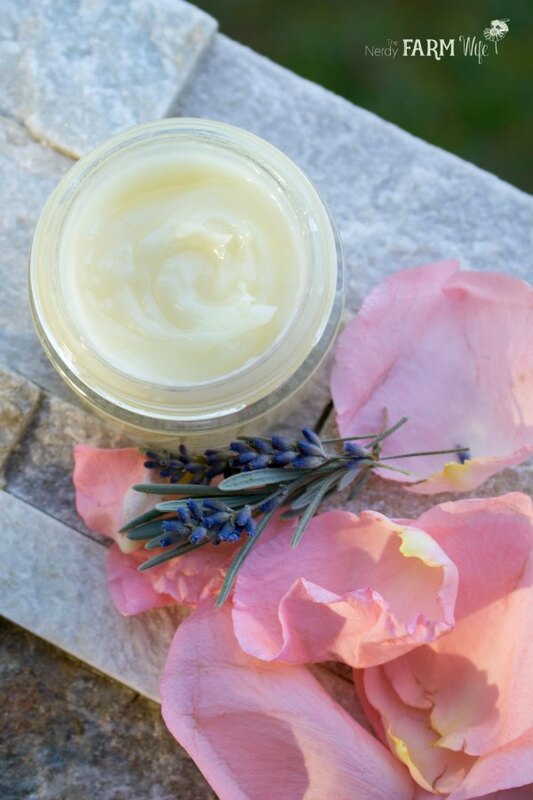 If you enjoyed this easy lavender rose balm recipe, let’s keep in touch! 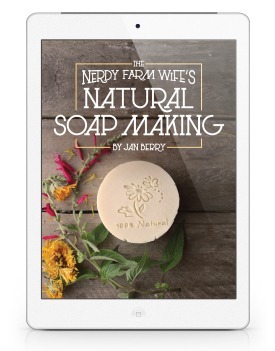 Subscribe to my newsletter and receive my best DIY body care tutorials, natural soapmaking recipes, plus fun and creative ideas for using the flowers and herbs that grow right around you. 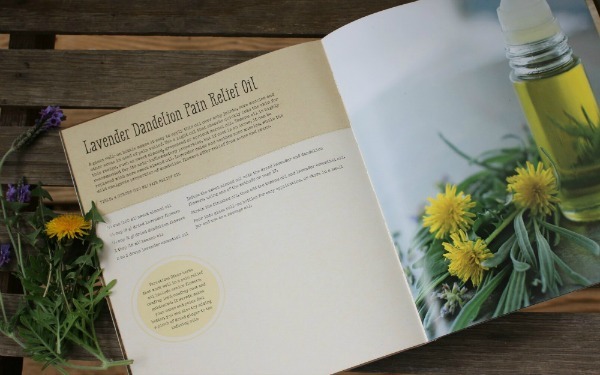 If you like the projects on my site, you’ll love my print book, 101 Easy Homemade Products for Your Skin, Health & Home! Available at Amazon or ask your favorite bookseller about it. Tagged balm, lavender, rose, salve. Bookmark the permalink. I have 2 if your books and they are my favs. You are easy to understand and so down-to-earth! Thank you! You are a lot of help to my business. I am a big fan of you handmade products. I have a question about the labels. I bought your e-book “things to make with roses” and I really like the design of labels in the package. I really want to customize the labels to different language and content. Could you tell me what website or online tool you use to create those labels? thank you so much! amazing recipe…please be kind to tell me .will this balm remain semi solid outside fridge ? like fluffy and all? Hello Jan, love your blog and recipes, you are amazing!! I did this recipe for my mom that is in bed the whole time, and we love it, she can talk but I am sure she love it too, noe I want to make the same recipe but as a cream, here in Mexico, in mu city start to be tooooo hoy, can I do that? 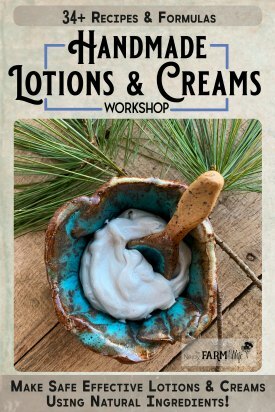 Please help to make a cream or lotion that doesn’t feel to greasy and have the same properties, but with out using a preservative, i don’t have one, is hard ro get it. I know it will decrease the like shelf, but is ok. Please help me… thank you.